When establishing a location for the Kansas City Jazz Festival in the early 1980s, organizers chose the south lawn of the Nelson Museum – back when it was controlled by the Parks Department and before it was landscaped – and Volker Park, also known as Theis Memorial Mall, immediately south of the Museum. They were chosen, in part, with the hope of presenting a jazz festival in a setting which would draw both Kansas City’s black and white populations. It was a good location. Later, the jazz festival merged with the blues festival and moved to the more multiple-stage accommodating Penn Valley Park. That was another good and neutral location. Two weeks ago I wrote about perceptions of 18th and Vine and how they impact the Rhythm and Ribs Jazz and Blues Festival. It drew several comments, all of which are greatly appreciated. • I don’t accept that racism, with rare exceptions, plays into suburban residents staying away from 18th and Vine. It’s an undeserved perception of danger, an image which has plagued the district for decades, which scares potential patrons away. The failure to overcome that image both frustrates and angers me. • One commentator noted people not wanting to venture into the areas surrounding 18th and Vine. That’s a valid point. When I was chairman of the Kansas City Jazz Commission, in the mid to late 1980s, the Executive Director of the Black Economic Union showed me extensive blueprint plans for renovating the jazz district. Most of it was not what was eventually built (though some of the since-constructed housing was there). My reaction at the time was that these were plans for an oasis surrounded by blight. You could not, I said more than 25 years ago, expect people to come to this jazz mecca if they had to pass through neighborhoods which were then far more uninviting and intimidating than what surrounds 18th and Vine today. The Executive Director agreed and assured me that renovation would grow beyond what I saw in those blueprints. But that’s never happened. As the Crossroads area has extended east – at one point including a performance space at 18th and Troost, which was featured in a story on KCUR – I hoped the uninviting neighborhoods would be bridged. But that, too, has never happened. • Also noted was a desire for a jazz festival in a neutral site, no doubt remembering the ones described in the opening of this post. One commentator is right in noting that parking around 18th and Vine for this year’s Rhythm and Ribs was a challenge. I was frustrated to see most of the known lots blocked off for use by, it seemed, anyone but me. I wound up parking in the VIP lot, on the west side of Paseo, not because I’m a VIP, but because I saw spaces available and nobody standing guard to tell me I couldn’t. The parks of the old festivals held advantages. But the fact is that in the 21st century, nobody is staging a jazz festival on those sites. Nobody is organizing volunteers, or raising money, or pulling in Kansas City’s civic structure, to stage a jazz festival in Volker Park or in Penn Valley Park. Instead, Kansas City’s civic community has coalesced its resources behind a jazz festival at 18th and Vine. Look for a moment at the 2007 Rhythm and Ribs Festival. All of Parade Park was fenced off. Headliners included Al Jarreau, George Benson, Pat Metheny and Bobby “Blue” Bland. Unless B.B. King was added, I don’t know how you could come up with a more stellar, all-star lineup for a jazz and blues festival in this century. The space, the star power, everything was in place for a breakout event. I don’t know how that festival drew or how it fared financially. But the fact that two years later there was no festival, and it subsequently returned downsized to accommodate around 7000 people, suggests much. A person with the proper pull could conceivably walk into Kansas City’s civic structure and use that example to suggest the city would be better served by a jazz festival in Penn Valley Park. But that person had best come prepared with a plan, the organization, and the backing to make the event happen. And that person had best come prepared to counter the participants favoring an 18th and Vine location, participants who this year hit their stride in producing an excellent event. I don’t see that happening. I’m not suggesting it should. The fact is, this city’s major jazz festival is taking place, for the foreseeable future, at 18th and Vine. I maintain the challenge to overcome is how to draw more people to the area. 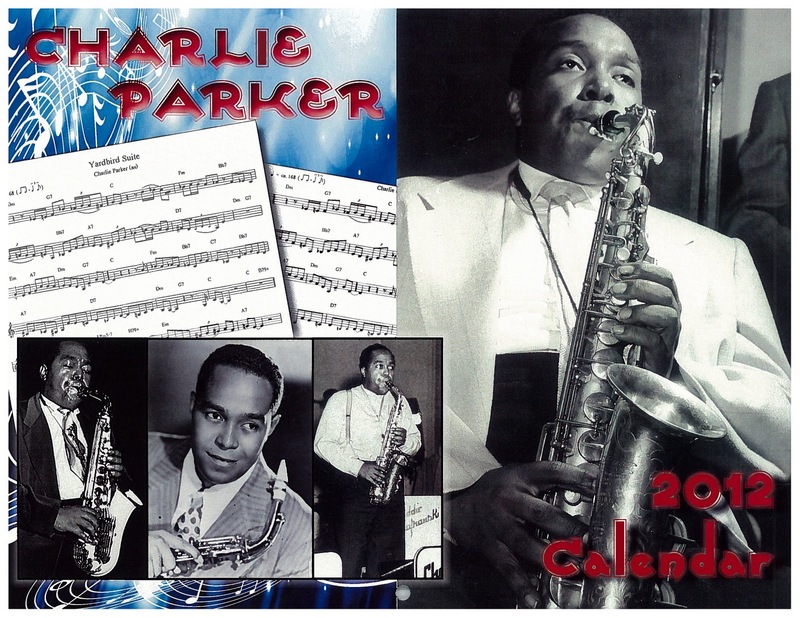 When the Mutual Musicians Foundation introduced Kansas City wine last August (here), also introduced was a 2012 Charlie Parker calendar. Each month showcases a photo of the great Kansas City-born alto saxophonist, ranging from age 14 months to a clipping of his funeral notice. In between are ubiquitous photos you’ll recognize – Bird with Jay McShann’s band – and some I haven’t seen, such as one of Parker performing in Birdland with Lester Young and Hot Lips Page. The Charlie Parker 2012 Calendar is available for $10.00 plus $2.50 shipping from SPG Publications, 1146 Harrison Street, Kansas City, MO 64106, or by phoning 816-842-9068, or by emailing design@serviceprintingonline.com. I just went through my first production cycle as a member of the production staff for the Rhythm & Ribs Jazz and Blues Festival which is produced entirely by the American Jazz Museum in association with the City of Kansas City, Missouri and a host of wonderful sponsoring organizations (who provide both, tangible and in-kind support). The Executive Producer of the festival is one of the best concert producers in the world and has worked many of the major festivals that are commonly known to even the least informed. I believe this festival will continue to get better and better in all respects each year. I also believe that the festival landscape in general has changed from what it was 20-30 years ago. Festivals seem to be inherently smaller in terms of scope and audience size. Particularly in smaller markets like KC. Those festivals (Monterey, Montreaux, North Sea, Pori, etc.) that continue in the large/multi-day format have entrenched infrastructures that support do so both, financially and in terms of logistics such as parking, etc. I exit onto The Paseo from I-70 to get to the 18th & Vine Jazz District. Indeed, the surrounding neighborhood doesn't look like Ward Parkway, a Lee's Summit subdivision; or, a suburban town in Johnson County, Kansas. However, I often drive from the FedEx Store on the Plaza back to the American Jazz Museum while doing errands and am amazed at the historic buildings along the way. We simply have to ensure that we get the word out in advance of our world class events that happen at places like The Blue Room and the Gem Theater - much in the way the other major venues in the region do. Nobody is concerned about going to the Madrid or Folley in this context. Nobody, in reality, is that concerned about going to events on "the vine". Race can be an issue anywhere, if it is going to be made one. We have 18th & Vine. We have the American Jazz Museum - the only place of its kind in the world. We have The Blue Room - among the best listening club venues in the world. There is no other place in the KC metro that can replace or supplant the jazz district as THE place for people music. Please note that these are only my personal opinions and observations which do not reflect official upon any policies or positions of the American Jazz Museum or anything else for that matter. Thanks.